A few nights ago we had company and I was looking for an easy dinner. 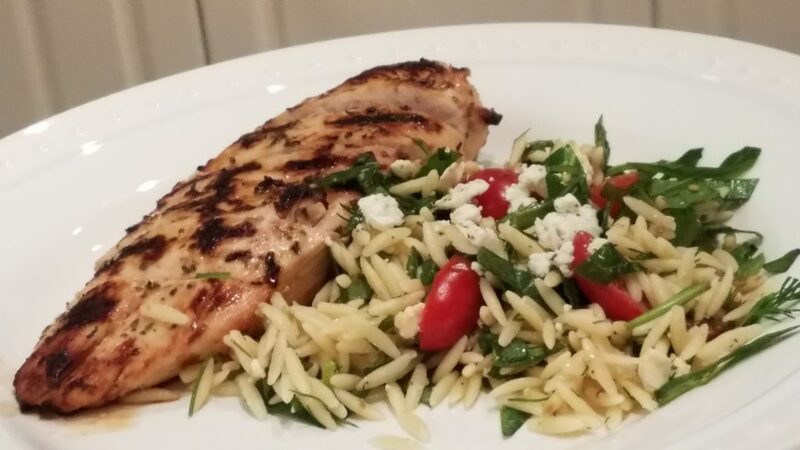 We started with hummus, moved to grilled chicken and orzo salad. Finished it up with homemade baklava. I made everything ahead of time, except the chicken which I tossed on the grill when we were ready to settle down and eat. Being able to visit with company instead of buzzing around the kitchen was wonderful. Since the menu included apps and a desert I decided having a side that doubles as the veggie and the starch was in order. Which brings us to the orzo salad. There is nothing in this recipe that can’t be eyeballed, you really don’t have to measure anything, honest. Start by cooking the orzo al dente, it’s going to keep cooking a little and if it’s over cooked it won’t soak up all the flavors. While it’s still warm dress it with lemon juice, lemon zest and olive oil. Set this aside to meld the flavors and let it cool a little. The next part is terribly hard (sarcasm) cut up all the veggies and herbs. Slice the grape tomatoes length wise. Chop the spinach but don’t go all wild with the knife, bruise it and wreck it, in fact if you have the patience; chiffonade. Do the same to the basil, bruised basil is ugly. Thinly slice the onion, green and white parts. Chop the dill, I had fresh the first time I made this but dry is perfectly fine. Once the pasta has cooled slightly mix all of the veggies, herbs and feta cheese with the orzo. If you make it the day of it’s perfectly fine to let it sit on the counter until it’s time to eat. The salad does taste better if it’s allowed to rest overnight in the fridge, allowing the flavors to mush together, and then come to room temperature to serve. This can be made two days ahead of time – however, wait until serving to add the basil, otherwise it will brown in the fridge. Spectacular served with grilled chicken or fish. Enjoy! While the orzo is still warm add the lemon juice, zest and olive oil. Stir to combine. Let the orzo sit aside and soak up all the flavors. Slice the maters length wise, chop the spinach (but try not to brutalize it), chiffonade the basil, finely chop the dill and slice the onion (white part too). Let the salad sit overnight in the fridge. Since it's best served at room temperature or with a slight chill plan ahead; pull it out a few hours before it's time to serve.